Open matches continue every Saturday. FIRST MATCH ON NEW LAKE YIELDS CONSISTENT CATCHES FOR ALL. The fisrt match on the Marshes, new lake at Bishops Bowl Fishery, put the top 5 anglers all within 10lbs of each other. Local club Devon AC were pleased to accept the challenge of the first match, with winner Paul Birch totalling 30lb 12oz, closely followed by Gavin Webb with 26lbs and Chris Buckley with 24lb 4oz. An enjoyable day for all involved. Saturdays match on Walworth lake meant a win for Martin Panter (M and P Floats) with 23lb 13oz made up of small tench and carp. 2nd was Terry Faulks, Bishops Bowl Lakes with 16lb 1oz and 3rd Steve Hatt, Banbury GUnsmiths with 12lb 8oz. 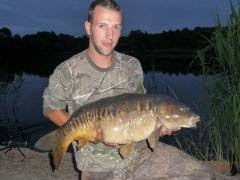 3rd Ryan Harris, Northampton Chiltern Baits 39lb 4oz. Mick Wheeler dominated the match on White Bishop Lake with a chopped worm and caster approach netting 55lb of small carp and skimmers. He topped up with 13lb of bigger fish to total 68lb 7oz. Nearest challenger was fishery owner Shaun Smart with 63lb 14oz including a 1lb 8 oz roach. All 20 anglers caught well.